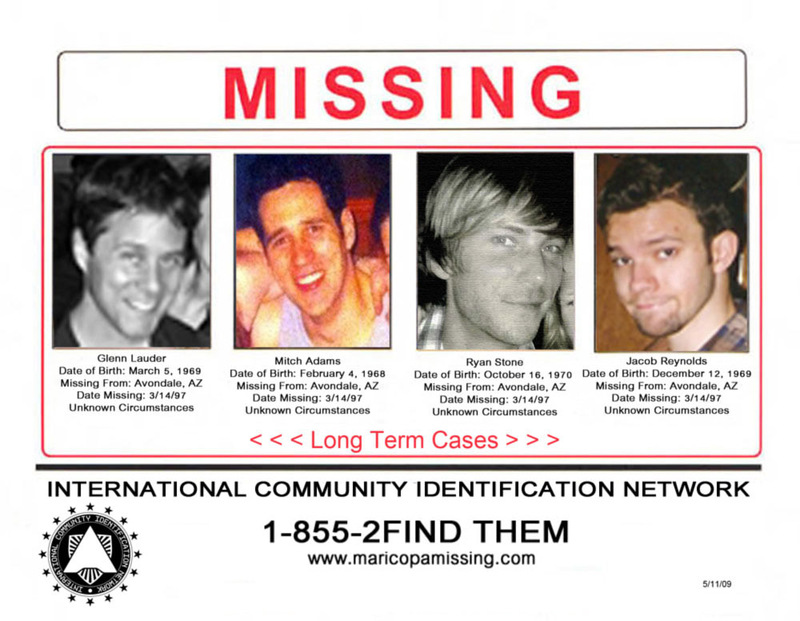 On March 13, 1997, our sons disappeared in the Estrella Mountain National Park, south of Phoenix, Arizona. Glenn Lauder (Born March 5, 1969), Mitch Adams (Born February 4, 1968), Ryan Stone (Born October 16, 1970), and Jacob Reynolds (Born December 12, 1969) were reported to the Maricopa County Sheriff's office, after they were last seen off-roading at the base of the Estrella mountains. A suspect was arrested in connection with their disappearance, however the Maricopa County Medical Examiner’s office stated they were 'victims of an animal attack,' after bone fragments were found in the area. An official statement from the Maricopa County Medical Examiner admitted there was not enough evidence for the results to be conclusive. On May 6, 2001 Arizona Federal Wildlife officials killed a 300-pound black bear suspected of attacking a camper in the Santa Rita Mountains near Tucson, AZ. The County Attorney's office said this was the same animal responsible for killing our boys, and the case was closed. Arizona Fish and Game officials disagree a bear this size could have been responsible for their deaths, since there has only been one reported fatality in Arizona over the past decade from a bear attack. Arizona Fish and Game said it is highly unlikely that an animal this size is capable of attacking four grown men. We are asking for the public's help in finding our boys. Anyone having information regarding this case, is encouraged to contact the Arizona Division of Missing Persons Criminal and Missing Persons Clearing house: www.maricopamissing.com or TOLL FREE 1-855-2FIND-THEM.